A transcribed version of the Norwegian national census was published on the Internet by the then Department of History at the University of Bergen in 1995. The census is now housed by Digitalarkivet (the Digital Archives), a division of Riksarkivet (the National Archives). Last week Digitalarkivet published the scanned version of the 1801 census. If you ever wonder if the transcribed version contains a mistake you are now able to check the original. A great new addition for all genealogists! The photo above lists the people living at the Holset (Hoelset) farm in Åmot, Østerdalen in 1801. The permanent page link can be found here, while the permanent photo link can be viewed here. For the transcribed version, go here. 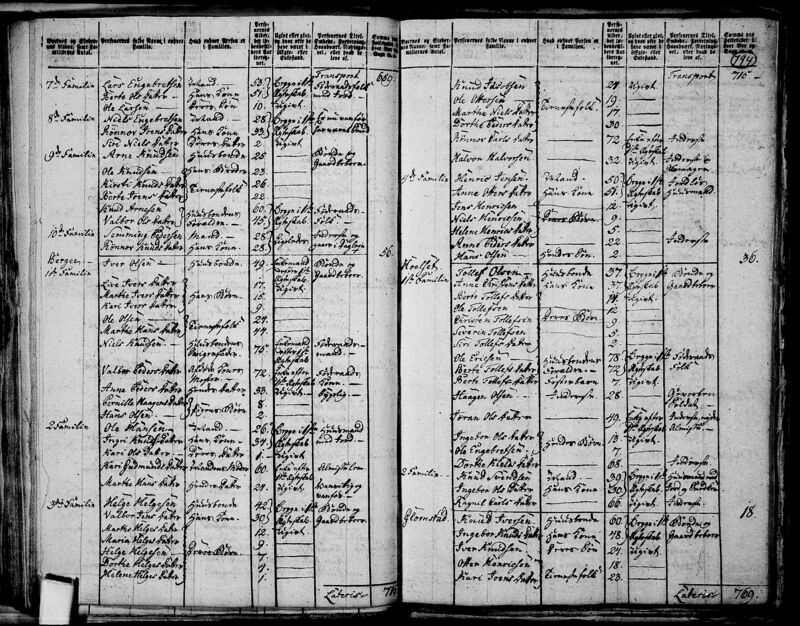 The survey shows among others my 5-x-great-grandfather Tollef Olsen Holset (1764-1840), his wife Anne Kristensdatter Glomstad (1762-1844), their children, Tollef's parents Ole Eriksen Holset (1723-1810) and Berte Tollefsdatter (1729-1820), some other relations as well as a cotter family. My Hoelseth family page can be viewed here. 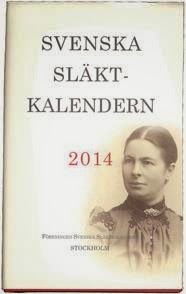 Svenska Släktkalendern 2014 ("The Swedish Family Calendar 2014") was published in May this year. The genealogical work is similar to the Svenska Adelskalendern (The Swedish Nobility Book), but "only" covers "commoner" families. I got the opportunity to leaf through it when I visited the Genealogy Convention in Karlstad, Sweden last weekend. I didn't buy it, but might do it later (it will also eventually be added to the book collection of the Norwegian Genealogy Society), as quite a few interesting families were included. 65 family articles are included, of those 22 have been covered earlier, while as many as 43 are new, including Prince Daniel of Sweden's Westling family. The families covered in the latest edition are: Ahnlund (from Annefors) (new), Alfvén (from Alunda) (new), Arrhenius (from Målilla), Aschan, Askagården (new), Azar (new), Berggren (from Gävle) (new), Bergman (from Högsby) (new), Bergström (from Jämtland) (new), Berzelius, Billing (from Stockholm) (new), Bjernald (new), Brodell (from Bro) (new), Carlsson (from Burseryd), Cleve, Clewberg (new), Dafgård, Dahlgren (from Norrköping), Djurberg (from Stockholm), Dravins (new), Ekroth (from Ytterselö) (new), Elmgren (from Lessebo) (a new branch added), Eschelsson (new), Esmaeilzadeh (new), Fagræus (new), Fioretos (new), Främby (new), Granit (from Korpo) (new), Hellström (from Björskog) (new), Klackenberg (new), Kraft (from Löderup) (new), Lagberg (from Skänninge) (new), Lagerlöf, Lindman (from Lindrum), Magnuson (the Sandviken family) (new), Meitner (new), Nathhorst, Nathurst; Nessler, Nässler (new), Nilsson (from Grythyttan) (new), Nordenvall (the Värmland family), Persson (from Tullstorp) (new), Plantin (from Umeå) (new), Rahm (from Ramsberg) (new), Ramstedt (the Stockholm family), Rappaport (new), Rosell (from Torpa) (new), Rossander (from Kisa) (new), Rur, Ruhr; Salmoon (new), Samuelsson (from Spekeröd) (new), Scheele (new), Seddigh (new), Siegbahn, Stecksenius, Stecksén (Daniel Olofsson's family) (new), Svart (from Aspeboda), Svartz (from Leksand), Svedberg (from Edebo) (new), Tegnér (from Tegnaby), Theorell (from Hudene) (new), Wattrangius (I) (new), Westling (from Hanebo - Prince Danilel's family) (new), Widerström (new), Wiesel (from Vislanda) (new),Wullt (new), Åkerhielm (Filip's branch). Svenska Släktkalendern (SSK) was published for the first time in 1885, then under the name Svensk Slägtkalendern, from 1889 Svenska Ättartal, before it got its current name in 1912. Since 1885 the calendar has been published with irregular intervals, but the last three editions every second year. The 2014 edition is no. 46. The calendar covers the basic genealogical-biographical facts about the family members, such as complete name including call name and nickname if given, birth date, profession/title, employment, positions and/or memberships in national organisations, honors (orders, medals), marriage, cohabitaiton or registered partnership as well as address (city, place). Föreningen Svenska Släktkalendern (The Swedish Family Calendar Society) is behind the publication, and the current editor is Magnus Bäckmark. The 2014 edition costs SEK 730. ISBN10: 9163751151. ISBN13: 9789163751158. Go to the official website for more details.